The tragic events that occurred ten years ago today that took the lives of 2,977 people and injured more than 6,000 others gave the prevailing lords of the realm an excuse to engage in an endless succession of wars designed to "make America safe" but have wound up killing untold thousands of innocent human beings in Iraq and Afghanistan and Pakistan and elsewhere. The naturalist of the false opposite of the "right" was our lord caesar between January 20, 2001, and January 20, 2009, George Walker Bush, brought the American economy to a state of ruin that made possible the election of a first-term propaganda machine of the false opposite of the naturalist "left," Barack Hussein Obama, who has proceeded to engage in his own version of endless wars, although for slightly different objectives, and committed this country to the spending of billions of dollars that has brought us from the point of ruin into the economic abyss. If World War II brought America out of the Depression, the post-9/11 "War on Terror" threatens to drag the country into one. So goes the conventional wisdom a decade after the life-changing attacks on the United States. The nation has paid a dear price in blood and treasure to hunt down the terrorist organizations that hijacked four commercial jetliners and toppled the World Trade Center towers in New York City. In addition to the 2,752 lives lost in the Sept. 11, 2001, attacks, more than 6,000 U.S. military personnel have been killed in Iraq and Afghanistan. According to estimates, wartime operations directly resulted in the deaths of 224,000 to 258,000 people, including 125,000 Iraq civilians. The economic cost to America is harder to quantify, and no less disturbing. Through 2012, the Congressional Research Service pegged the estimated cost of war funding at $1.4 trillion. But that figure has been called unduly conservative. "I don't know what the president knows, but I wish it were a trillion," Boston University professor Neta Crawford told Reuters. Anticipated benefits for veterans through 2050: $589 billion to $934 billion. Additional Pentagon appropriations: $326 billion to $652 billion. Projected war-related spending between 2012 and 2020: $453 billion. Homeland Security spending: $401 billion. "Social costs" paid by service members and their families: $295 billion to $400 billion. Interest payments for debt incurred from borrowing for war spending: $185 billion. War-related foreign aid: $74 billion. Joseph Stiglitz, a Columbia University economist, calculated the costs between $3 trillion and $5 trillion -- and that was three years ago. "With almost 50 percent of returning troops eligible to receive some level of disability payment, and more than 600,000 treated so far in veterans' medical facilities, we now estimate that future disability payments and health care costs will total $600 billion to $900 billion," Stiglitz wrote in a book, "The Three Trillion Dollar War," co-authored with Linda Bilmes. "The social costs, reflected in veteran suicides (which have topped 18 per day in recent years) and family breakups, are incalculable," Stiglitz said. Stiglitz argues that the post-9/11 military operations have contributed to America's "macro-economic weaknesses, which exacerbated its deficits and debt burden." Disruption in the Middle East led to higher oil prices, forcing Americans to spend money on oil imports that they otherwise could have spent buying goods produced in the U.S. The Federal Reserve hid these weaknesses by engineering a housing bubble that led to a consumption boom. The economic and social effects of the tragedies that unfolded ten years ago today, however, really fade into insignificance when one considers the fact that the maudlin display of sentimentality and emotionalism that has occurred in their immediate wake and in the succeeding ten years has permitted even believing Catholics to suspend rationality in order to accept all manner of "interfaith services" in order to "commemorate" the dead and the wounded on the "sacred ground" of the former World Trade Center complex and the Pentagon and the field in Stonycreek Township near Shanksville, Pennsylvania, where United Airlines Flight 93 crashed to the ground. Many such "interfaith services" were held in formerly Catholic churches across the nation in the first month after the attacks. One of those occurred at the now demolished Yankee Stadium on Sunday, September 18, 2001, where only "Bishop" Thomas Daily, the conciliar "bishop" of Brooklyn at the time, and an Armenian bishop and three Protestant clergymen mentioned the Holy Name of Our Blessed Lord and Saviour Jesus Christ in the mockery of the First Commandment that took place there that day: Twenty-three other clergymen did not so. One of them who refused to mention the Holy Name of Jesus or to invoke the Most Blessed Trinity for a blessing was Edward "Cardinal" Egan, then the conciliar "archbishop" of New York. This could have been given by the grand master of Masonic lodge or a Talmudic synagogue. We gather here this evening to pray for the happy repose of the souls of those who were killed. The Holy Sacrifice of the Mass is the unbloody re-presentation or perpetuation of the one Sacrifice offered by the Son to the Father in Spirit and in Truth on the wood of the Holy Cross to pay back the blood debt owed because of Original Sin. The Mass extends the Sacrifice of Calvary in time, making present the fruits of Our Lord and Savior Jesus Christ's Redemptive Act to the Church Militant here on earth and the Church Suffering in Purgatory. Thus, we pray tonight that the fruits of this Mass will assist the souls of those who were killed one year ago today. Why do we have Masses offered for the dead? Why can't we assume that those killed so suddenly one year ago today are in Heaven? Well, the answer is very simple. Nothing impure can enter Heaven. Very few people who are in a state of sanctifying grace at the time of their deaths have paid back the entirety of the debt they owe God because of their forgiven mortal sins and their general attachment to sin. God has given us the grace of Purgatory so that those who died in a state of final justification can pay back after death that which they owed at the time of their deaths. We in the Church Militant on earth can assist the members of the Church Suffering in Purgatory by remembering them in our prayers and, most especially, by having Masses said for them. We are gathered here principally to offer the fruits of this Mass to those souls who died a year ago who are in need of this satisfaction. Some of you might ask, "Your Eminence, what if my loved one is in Heaven? Why should I pray for him and have Masses said for him? After all, he died so tragically?" Well, we have to understand that a tragic death is not the same thing as a holy death. While one of the priests near the World Trade Center did give General Absolution to all of those who were in danger of death as the twin towers collapsed, we do not know very much about who died at any particular time. Thus, to be on the safe side, therefore, we continue to pray. Believe me, as Padre Pio taught, no prayer is ever wasted. If one of our loved ones is in Heaven, our dear Blessed Mother will direct the fruit of those prayers to some other deserving soul. So, my friends, we continue to pray and to have Masses offered for the souls of all of our relatives and friends, including those who died one year ago today in the events of September 11. We also pray, obviously, for the consolation of those who still grieve over the death of their loved ones. The fruits of the Mass are meant to fortify them, especially by means of the worthy reception of the Body, Blood, Soul, and Divinity of the God-Man, Jesus Christ, in Holy Communion. One of the things that has been lost in the past year is the fact that death is going to come to us all, including ourselves and our relatives, sometimes when we least expect it. "You do not know when the Master will come. The Master comes like a thief in the night." We must be prepared at all times to die, which is why we should be mindful about being in a state of sanctifying grace at all times. One of the best ways we can prepare to meet the Divine Redeemer in the face is to spend time with Him in prayer before the Blessed Sacrament, to develop a deep and tender devotion to His Most Blessed Mother, especially through her Most Holy Rosary, and to frequent the Sacrament of Penance in order to root out sin from our lives and to so increase the beauty of our souls and the fervor with which we receive Holy Communion. Our Lord's Easter victory over sin and death puts the events of each one of our lives and the world in their proper perspective. Meaning not to disparage for one moment the depth of the pain and the suffering that has visited so many people in the past year, we have to remember that there is nothing any of us can suffer, including the sudden and unexpected and unjust loss of a loved one, that is the equal of what one of our venial sins caused Our Lord to suffer in His Sacred Humanity on the wood of the Holy Cross. Our pain and our suffering are meant to unite us to the pain and suffering experienced by the God-Man as He hung atop the heights of Golgotha to make it possible for us to realize an unending Easter Sunday of glory in Paradise. Suffering is redemptive if we offer it up in union with the Cross of Christ. And those who are totally consecrated to the Mother of God entrust all of the merit they earn by the patient embrace of their own daily crosses to her Immaculate Heart, knowing that she will not deny them anything at the moment of their own deaths if they remain faithful to the end. It is also from the Cross of Jesus Christ that we learn of the divine mandate to forgive those who harm us and our loved ones. "Father, forgive them, for they know not what they do." (Luke 23:34) The Pater noster teaches us: "Et dimitte nobis debita nostra sicut et nos dimittimus debitoribus nostris." (And forgive us our trespasses as we forgive those who trespass against us.) That is, if we want to be forgiven by Our Lord then we must offer that forgiveness to others, including those who perpetrated the horrible attacks on this country a year ago today. This does not mean that it is wrong to seek to bring to justice anyone who aided the now dead terrorists. Not at all. However, it does mean that we must recognize that the beneficiaries of Divine Mercy must also be the administrators of such mercy in their own lives. This is hard. It is not possible to do on the natural level. It goes against every fiber of fallen human nature. We can only offer such forgiveness when we cooperate with supernatural grace to understand our total reliance upon Christ's Mercy. As the late Father John Hardon once noted, "God permits us to sin so that we can forgive each other." Indeed. The events of September 11, 2001, call to mind the sanctity and inviolability of each innocent human life. Please understand what it is I must say at this point. Unless I do say it, however, I will be remiss in my obligation as a Successor of the Apostles to preach the fullness of the splendor of Truth Incarnate in charity. Every human life is made in the image and likeness of the Blessed Trinity. Our Lord could have become man any way He chose. He is the Logos, the Word, through Whom all things were made. There is nothing lacking in His omnipotence as God. He chose to enter human history so as to redeem us on the wood of the Holy Cross by being conceived as a helpless embryo in His Blessed Mother's virginal and immaculate womb by the power of the Holy Ghost at the moment of the Incarnation. Our Lord and Savior Jesus Christ is the Lord of history. He knew that there would come a time in the history of the created world that innocent human life in the womb would be subject to barbarous extermination under cover of law, yes, even in these United States. One of the reasons Our Lord condescended to become the prisoner of the tabernacle of Our Lady's virginal and immaculate womb was to place Himself in solidarity with every child in every mother's womb without exception. Although He cannot suffer again in His Glorified Body, He did teach us that "Amen I say to you, as long as you did it to one of these my least brethren, you did it to me." (Mt. 25:40) The least of His brethren are in the womb today, totally defenseless, totally dependent upon their mothers and those around them to protect their absolute inviolability. Thus, to kill a child in the womb is to execute mystically Jesus Christ. I repeat: every abortion is a mystical destruction of Jesus Christ in the person of unborn babies. We cannot say we love Our Lord and support His destruction mystically in the wombs of mothers under cover of law. Over one million babies have been put to death under cover of law since September 11, 2001. Again, meaning to disparage not one whit from the suffering of those gathered here this evening, we must also grieve for the deaths of these innocent children-and for the over 40 million children who have been put to death in this country under cover of law since the killing of children became "legal" in California in 1967, in our own State of New York in 1970, and on demand nationally as a result of the U.S. Supreme Court decision in Roe v. Wade on January 22, 1973. A nation that puts to death the innocent unborn under cover of law makes itself more vulnerable to attacks from those outside of our borders, people who have no more respect for the inviolability of our lives than we do for the most defenseless within our own midst. No amount of show of military force will render such a nation secure as long as it permits the shedding of innocent blood under cover of law. Thus, in the presence of so many public officials, most of whom support this slaughter of the unborn by the use of various linguistic devices designed to anesthetize the reality of child-killing, I must remind everyone here that human law must be conformed to the binding precepts of the Divine positive law and the natural law. Contingent beings whose bodies are destined for the corruption of the grave until the Last Day do not determine right and wrong. We have the obligation to subordinate our lives, both individually and collectively in society, to God's Sovereignty over us and our societies. We make our nation more vulnerable to attacks from without as long as we refuse submission to that sovereignty, taking it upon ourselves to deny the sanctity and inviolability of innocent human life in the womb. If we want to make our country more secure, and therefore a more fitting instrument in the pursuit of justice both here and abroad, then we must stop all forms of abortion, chemical and surgical alike. To honor those killed on September 11 of last year, we must defend innocent life in the womb without exception. A ceremony is taking place at Ground Zero to remember the dead. As soothing as that might be, the Mass is the only place where true and eternal consolation will be found for the dead and those who mourn them. And it is from the Mass that we will receive the graces to recognize that every abortuary is a "Ground Zero" of its own, requiring us to pray for the conversion of those who call down upon themselves the blood of the innocent and who thereby put the entire country in greater jeopardy from attacks from without. May Our Lady, the Mirror of Justice, pray for us so that we will be fortified in this Mass to remember the dead always in our prayers, and to understand our obligation to prevent further blood from being shed in our own land. God is merciful. However, He is also just. We cannot guarantee that a fidelity to God's laws will keep us secure from attacks leveled against us by terrorists bent on destruction. However, a Catholic does know with certainty that fidelity to God's laws is the surest way to save his soul, and thus to plant the seeds for a world where everyone lives in the shadow of the Holy Cross for the glory of Christ the King and Mary our Queen. There will be no such talk today in conciliar churches or in the various "interfaith services" that will be held around the nation. No, there will be talk of a "generic" God Who is pleased by any and all "prayers" that are offered to him by anyone in the "human family." Congressman Randy Forbes, a Republican representative from Virginia and a co-chairman of the Congressional Prayer Caucus, sent Mr. Bloomberg a letter on behalf of the caucus members urging him to include prayer in the ceremony. At the same time, some evangelical Christian leaders said they were outraged that an interfaith prayer service planned by the Washington National Cathedral did not include a Southern Baptist or other evangelical minister. In a nation of unprecedented religious diversity, the United States once managed to navigate religion in public life with relatively generic acknowledgments of the sacred — a tradition often referred to as civil religion. For a decade, New York City has conducted the same ritualized ceremony on each anniversary of the attacks. The heart of the ritual has been the reading aloud of the names of the victims. In 2003, the victims’ children read the names; in 2004, it was their parents; and in 2007, the honor went to first responders. The names are read in a continuous stream for hours, with four breaks to allow moments of silence at the times when hijacked planes struck the two World Trade Center towers, and when each tower fell. This year, there will be six moments of silence, to acknowledge also the planes that hit the Pentagon and the ground near Shanksville, Pa., said Stu Loeser, Mr. Bloomberg’s press secretary. “The structure for this program was designed 10 years ago, with the consultation of a lot of families of those who died, and it is primarily for the families,” Mr. Loeser said. It is wrong to say the ceremony excludes prayer or clergy members, Mr. Loeser said. Chaplains for the Fire and Police Departments and the Port Authority police often attend, and “we think most people use those moments of silence for reflection and prayer,” he said. But these explanations have not prevented the controversy from becoming a galvanizing issue for conservative religious groups and media outlets and Christian talk radio. This is actually a good thing as the Holy Name of God will not used generically to continue the perverse "tradition" of "America's civil religion." There is no such thing as "civil religion." Divine Revelation matters, and It has been entrusted by the Second Person of the Most Blessed Trinity made Man in the Virginal and Immaculate Womb of His Most Blessed Mother by God the Holy Ghost at the Annunciation to the Catholic Church that He founded upon the rock of Peter, the pope. What refers to domestic life in the teaching of the naturalists is almost all contained in the following declarations: that marriage belongs to the genus of commercial contracts, which can rightly be revoked by the will of those who made them, and that the civil rulers of the State have power over the matrimonial bond; that in the education of youth nothing is to be taught in the matter of religion as of certain and fixed opinion; and each one must be left at liberty to follow, when he comes of age, whatever he may prefer. To these things the Freemasons fully assent; and not only assent, but have long endeavored to make them into a law and institution. For in many countries, and those nominally Catholic, it is enacted that no marriages shall be considered lawful except those contracted by the civil rite; in other places the law permits divorce; and in others every effort is used to make it lawful as soon as may be. Thus, the time is quickly coming when marriages will be turned into another kind of contract -- that is into changeable and uncertain unions which fancy may join together, and which the same when changed may disunite. Then come their doctrines of politics, in which the naturalists lay down that all men have the same right, and are in every respect of equal and like condition; that each one is naturally free; that no one has the right to command another; that it is an act of violence to require men to obey any authority other than that which is obtained from themselves. According to this, therefore, all things belong to the free people; power is held by the command or permission of the people, so that, when the popular will changes, rulers may lawfully be deposed and the source of all rights and civil duties is either in the multitude or in the governing authority when this is constituted according to the latest doctrines. It is held also that the State should be without God; that in the various forms of religion there is no reason why one should have precedence of another; and that they are all to occupy the same place. That these doctrines are equally acceptable to the Freemasons, and that they would wish to constitute States according to this example and model, is too well known to require proof. For some time past they have openly endeavored to bring this about with all their strength and resources; and in this they prepare the way for not a few bolder men who are hurrying on even to worse things, in their endeavor to obtain equality and community of all goods by the destruction of every distinction of rank and property. What, therefore, sect of the Freemasons is, and what course it pursues, appears sufficiently from the summary We have briefly given. Their chief dogmas are so greatly and manifestly at variance with reason that nothing can be more perverse. To wish to destroy the religion and the Church which God Himself has established, and whose perpetuity He insures by His protection, and to bring back after a lapse of eighteen centuries the manners and customs of the pagans, is signal folly and audacious impiety. Neither is it less horrible nor more tolerable that they should repudiate the benefits which Jesus Christ so mercifully obtained, not only for individuals, but also for the family and for civil society, benefits which, even according to the judgment and testimony of enemies of Christianity, are very great. In this insane and wicked endeavor we may almost see the implacable hatred and spirit of revenge with which Satan himself is inflamed against Jesus Christ. -- So also the studious endeavor of the Freemasons to destroy the chief foundations of justice and honesty, and to co-operate with those who would wish, as if they were mere animals, to do what they please, tends only to the ignominious and disgraceful ruin of the human race. The evil, too, is increased by the dangers which threaten both domestic and civil society. As We have elsewhere shown, in marriage, according to the belief of almost every nation, there is something sacred and religious; and the law of God has determined that marriages shall not be dissolved. If they are deprived of their sacred character, and made dissoluble, trouble and confusion in the family will be the result, the wife being deprived of her dignity and the children left without protection as to their interests and well being. -- To have in public matters no care for religion, and in the arrangement and administration of civil affairs to have no more regard for God than if He did not exist, is a rashness unknown to the very pagans; for in their heart and soul the notion of a divinity and the need of public religion were so firmly fixed that they would have thought it easier to have city without foundation than a city without God. Human society, indeed for which by nature we are formed, has been constituted by God the Author of nature; and from Him, as from their principle and source, flow in all their strength and permanence the countless benefits with which society abounds. As we are each of us admonished by the very voice of nature to worship God in piety and holiness, as the Giver unto us of life and of all that is good therein, so also and for the same reason, nations and States are bound to worship Him; and therefore it is clear that those who would absolve society from all religious duty act not only unjustly but also with ignorance and folly. . . . Even though there were many heroic acts of sacrifice on the part of those who responded to the tragedies in New York and in Virginia and Pennsylvania, and even though we can never minimize the loss of a single innocent human life or the tears that have been shed by their loved ones in the past decade, none of the courage or the loss or the suffering can redeem a single moment's exercise in religious indifferentism that offends God so infinitely as He is an Infinite Being Who is Our Creator, Redeemer and Sanctifier: God the Father, God the Son and God the Holy Ghost. God must chastise men for sins against the First and Second Commandments that have brought about and been the essence of "interfaith" religious services as every :religion other than Catholicism is from the devil. God must chastise men for sins against the Third Commandment as His day, Sunday, becomes a day of political talking head shows and football games and displays of sentimentality and national self-congratulations on our "greatness" as a people, who shop on Sundays and engage in unnecessary servile labor. God must chastise men for sins against the Fourth Commandment as the Natural Law rights of parents to educate their children are usurped by the civil state and as citizens are "commanded" to "obey" unjust laws enacted and enforced by civil leaders who do not seek the common temporal good in light of man's Last End, the possession of the Beatific Vision of God the Father, God the Son and God the Holy Ghost for all eternity in Heaven. God must chastise men for sins against the Fifth Commandment as innocent babies are killed in abortuaries and women's "health care centers" and hospitals, which also dispatch "brain dead" people by various means. He must chastise men for sins against the Fifth Commandment by the prosecution of needless, unjust wars that wind up doing more harm than good, killing thousands upon thousands of innocent human beings. God must chastise men for sins against the Sixth and Ninth Commandments as countless sins against Holy Purity are promoted, justified and then protected ultimately under civil law and in the name of "freedom" and as His Sovereignty over the sanctity and fecundity of marriage is denied by means of divorce, contraception and perversity. God must chastise men for sins against the Seventh Commandment are the civil government robs us of our private property to pay for wars and domestic programs that are violations of the principle of subsidiarity and then wind up taking away more and more legitimate human liberties. He must chastise men for sins against the Seventh and Tenth Commandments as corporate robber barons charge people usurious interest rates to purchase major appliances and houses and as they treat both hourly workers and those with fix salaries as dispensable commodities whose utility to them is but a bad quarterly report away from being shipped to Red China or The Philippines or Sri Lanka or India or Indonesia or some other foreign locale. God must chastise men for sins against the Eighth Commandment as lies about Him are told by the leaders of the counterfeit church of conciliarism and other false religious sects and secular leaders so as to convince men that Catholicism is not the one and only foundation of personal and social order. God must chastise men for sins against the Tenth Commandment as men spend their days plotting to gain the land or the money or the talents of those they deem to be "unworthy" of having more that they do. God must chastise men for their lukewarmness, their failure to pray His Most Blessed Mother's Most Holy Rosary at all, no less with fervor and devotion, their refusal to spend time with Him in His Real Presence in the Most Blessed Sacrament in those places where He is actually present in this time of apostasy and betrayal. God must chastise men for their worldliness and for their vanity. And you have forgotten the consolation, which speaketh to you, as unto children, saying: My son, neglect not the discipline of the Lord; neither be thou wearied whilst thou art rebuked by him. For whom the Lord loveth, he chastiseth; and he scourgeth every son whom he receiveth. Persevere under discipline. God dealeth with you as with his sons; for what son is there, whom the father doth not correct? But if you be without chastisement, whereof all are made partakers, then are you bastards, and not sons. Moreover we have had fathers of our flesh, for instructors, and we reverenced them: shall we not much more obey the Father of spirits, and live? And they indeed for a few days, according to their own pleasure, instructed us: but he, for our profit, that we might receive his sanctification. In other words, God must chastise men and their nations. He must chastise each one of us. What happened on September 11, 2001, was indeed a chastisement. 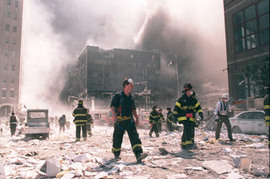 God has chosen infidels of one sort or another to punish those with Whom He is displeased, and even though it is true that those who were responsible for the deaths of those 2,977 human beings on that day are responsible to Him for their heinous crimes, it is also that a nation that kills over four thousand innocent babies every day by surgical means alone, to say nothing of the thousands more killed by chemical abortifacients, can continue expect chastisements from enemies found within and without. For, as I noted ten years ago now at a time that I was an indulterer who also went the conciliar "liturgy" during the week, we've done this to ourselves. Yes, God is chastising us in other ways. The midget naturalists of the "right" and the "left" are a chastisement. The statist policies of the current caesar is a chastisement.. And, of course, the unusual weather events of the last few weeks should serve as a warning to each of us that God is chastising us to correct us so that we can make reparation to Him for our sins through the Sorrowful and Immaculate Heart of Mary. While I pray every day for those who died ten years ago today, praying as well for the consolation of their families, especially at this time, we must never lose sight of the simple truth that being dying as a result of a terrible tragedy does not guarantee the salvation of someone's immortal soul. How many of those who were killed that day were even thinking about preparing themselves for death by meditating upon the Four Last Things (Death, Judgment, Heaven, Hell) every night after undertaking an examination of conscience during their night prayers? This is not to pass subjective judgment on anyone. Not at all. It is to point out that the pagan naturalism on display today at "ground zero" in the Borough of Manhattan of the City of New York, New York, had a grips on the minds and hearts of at least some of those who died there ten years ago do. The real tragedy, of course, of September 11, 2011, is that even one immortal soul, made in the image of God and redeemed by the shedding of every single drop of His Most Precious Blood on the wood of the Holy Cross by His only-begotten Son, Our Blessed Lord and Saviour Jesus Christ, was lost ten years ago today by dying a sudden and unprovided for death. Such a soul, if only one--and there were many more others in all likelihood, was but a victim of the Americanist ethos of religious indifferentism--the "civil religion"--that is but such a perfect embodiment of the ethos of Judeo-Masonry. All the more reason to give out truly blessed Green Scapulars to those whom God's Holy Providence places in our paths every day, praying "Immaculate Heart of Mary, pray for us now and at the hour of death"
All the more reason to pray Our Lady's Most Holy Rosary in reparation for our sins and those of the whole world. All the more reason for us to get serious about the sanctification of our own souls by withdrawing more and more from the world and its false currents, including the sentimentality that has replaced the true Faith in daily life and most particularly on occasions of national tragedies and of their annual commemorations. May we continue to pray for our beloved country so that she will be converted to the Social Reign of Christ the King as the result of the Triumph of the Immaculate Heart of Mary as her Fatima Message is fulfilled. It will be then that "America's civil religion" will be replaced by the true religion, Catholicism, which is, of course, the one and only foundation of personal and social order. "Vivat Christus Rex! Viva Cristo Rey!"